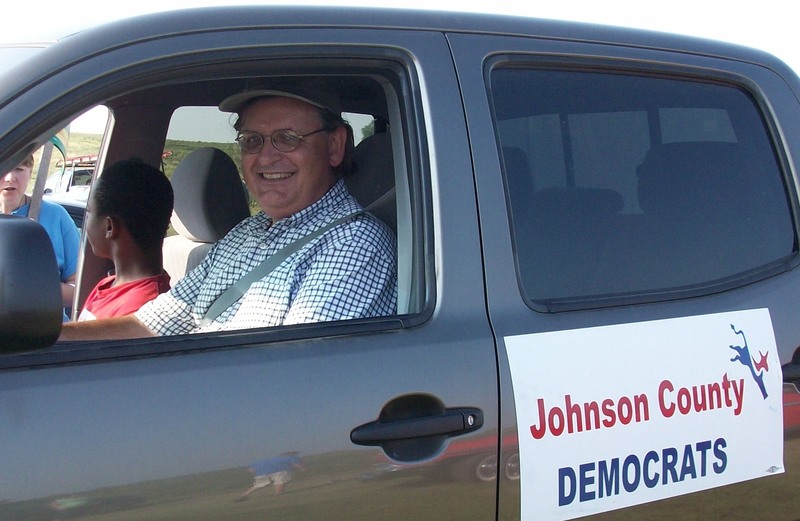 The author driving a parade vehicle in Morse, Iowa. Four and a half inches of snow rests on the driveway waiting to be removed. I like snow and don’t mind shoveling. I’ve gotten better at it since beginning work at the home, farm and auto supply store — a moderately physical job. While fluffy snowflakes fell yesterday afternoon I made a batch of hot chocolate mix using ingredients from the pantry, enough to last until spring. I had to grind the granules of powdered milk in the blender because they would not dissolve as they were. The warm, steamy drink is comforting and the best option after fresh apple cider from the orchard was used up. Local political news was dominated by the Iowa Democratic Party’s release of proposed changes to the 2020 Iowa precinct caucuses. I read the 65-page proposal, which is open to public comments for the next 30 days, and believe it is what Price said, a move to make participation more accessible and transparent. I also believe the Democratic National Committee forced Iowa to take these kinds of steps to remain first in the nation. Let’s face it, getting any group together for a meeting at a specific time in February is a challenge. By adding what are called “virtual caucuses,” the proposal provides a method for people to participate if they are unavailable to venture into a cold February night to hang with other residents of a precinct for an hour or so. I’m all for it. The Iowa national delegate selection process seems arcane to those in the media who follow the presidential horse race and report on it. They build up to the caucus and need to report a “winner.” When viewed in terms of winners and losers it is hard to say what winning delegates in Iowa means to a Democratic presidential candidate. The first month of the primary and caucus calendar has the early states, Iowa, New Hampshire, Nevada and South Carolina, about a week apart. They will be followed by Super Tuesday during which nine states hold presidential votes, including Texas and California. What traction candidates may get out of Iowa is dampened by the close proximity of these other contests. To make sense of the horse race, all 13 early states should be viewed through the same frame. It is hard to say if the caucuses are important. Political scientist David Redlawsk asserts the Iowa caucuses remain important and wrote a book about why. Last night on Twitter Redlawsk posted, “Caucuses are about party building & organization as well as voting.” For those of us who have been trampled by a mass caucus exodus immediately following precinct delegate selection, the merits of Redlawsk’s assertion about “party building” are dubious at best and border the ridiculous. In our precinct we’ve mostly struggled to fill our committee assignments to the county party convention with caucus-goers who will show up. We have even nominated people not present to fill the two county party central committee seats rather than let one go empty. This is the main organizing that goes on at the Iowa caucuses. With the notable exception of 2008, participation is mostly by people who have been very active in party politics. The pre-caucus publicity and outreach of campaigns helps activate voters. In an electorate where more voters register no preference instead of for one of two major parties, it serves the general election more than any political party. I’m sure discussions about what happened at caucus circulate among dinner tables and community social events where the mix of party affiliations is diverse. That’s something. It is hardly being organized. We’ll see how the 30-day comment period on the new process goes. I’m guessing there will be tweaks rather than major changes by the time it is finished. Now that Iowa Democrats developed a reasonable plan to make the Iowa caucuses more inclusive and transparent, the next step is working to flip my precinct and our state from Trump to Democratic in the general election. I don’t subscribe to a paternalistic notion that our Democratic presidential selection process beginning with the caucuses is rigged by the party. Just read the plan and explain how it favors someone. It doesn’t. Let Democrats nominate who they will and chips fall where they may. We should all be working for the eventual nominee whoever it is, beginning now.